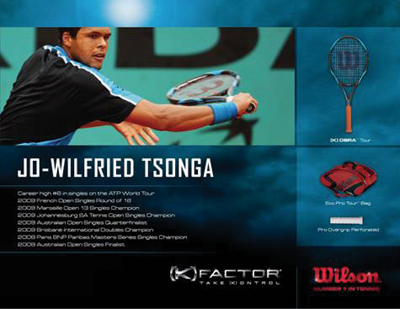 Jo-Wilfried Tsonga is ready to take on the competition with his new racket, the Wilson [K]obra Tour. After much success, reaching a career high #6 on the ATP Tour with the [K]Blade Tour racket, Jo-Wilfried was still searching for a racket that would give something extra on his shots. So in the past few months, Jo-Wilfried worked closely with Wilson Global Tour Equipment Manager, Ron Rocchi to find the best racket for his game. Jo-Wilfried will be in action tomorrow against Schuettler at the Roger Cup in Montreal. The US Open starts Monday August 31st.